IS THERE A PATTERN TO FIGURATE NUMBERS? I can't believe I'm posting this picture. Is there a pattern to the clothes that I'm wearing? 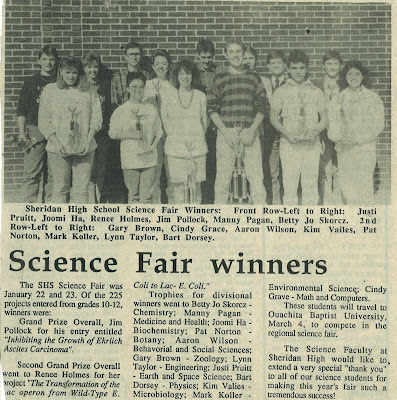 This was my junior science fair project I think, and the article above is for our senior year's science fair. Is that a Swatch watch I'm wearing? So how many of us stayed up until the wee hours of the night finishing (starting) our projects? 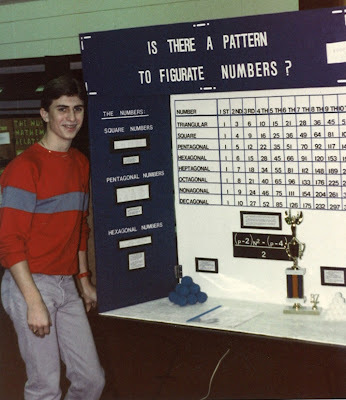 Correct me if I'm wrong, but the science fair gave birth to one of Ausbrook's famous lines, "You can put wads of paper on the back of your Elvis Presley jacket and call it the Appalachian Mountains if you want to!" Seems that Scott Herron actually did this - paper wads on the back of a leather jacket - and called it the Appalachian Mountains and whah-la! Science fair project. I'll check with my sources to confirm. Oh, sorry - you're probably dying to know... IS there a pattern to figurate numbers? Actually it was not a leather jacket but the inside of an Elvis Record jacket. The cardboard jacket cover to an old vinyl LP of Elvis Presley. He glued wads of paper on the cardboard and called it Appalachian mountains. I asked him why Appalachian mountains and he replied - "I was over at my girlfriend's house and she only had the "A" encyclopedia." Scott was the same one that, during a current events report on insulation said "They have an insulation that is so good now that all you have to do is strike a match in your house in November and it will stay warm in the house until Februrary." I couldn't do anything but smile and write down his "F". I remember a trip to Puerto Rico and the term/description of a Baluga (sp?) whale being harpooned on the beach.